Recently my friend Mike, who works among the Yali people of Kosarek, forwarded me something he had written up after his last flight with me. I thought this worth passing along. Don't worry...I don't scare all my passengers...at least I don't think so. This past month, I made a trip into Kosarek for a couple of weeks without the family. As the plane was approaching Kosarek, I was listening on my headset to the exchange between the two pilots in the front of the airplane. 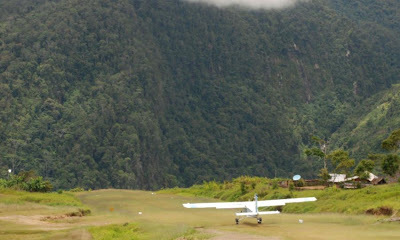 The senior pilot began saying, “I think this altimeter is off.” Having absolute confidence in our pilots, and having made this trip many times before, I was not at all concerned… until we made our final approach to the airstrip. The approach into Kosarek means heading directly toward the face of a mountain that rises about 1,700 feet above the airstrip, and then making a U-turn across the valley to make the approach for landing (the picture below shows the plane on take-off going toward the mountain). As we kept getting closer to the face of the mountain (certainly closer than I had ever been before) the pilot kept voicing his suspicion about a faulty altimeter. Finally, as we were (what felt to me like) about “arms-length” from the trees, the pilot confirmed, “Yeah, this altimeter is definitely wrong.” In my mind these two things did not sit well together, and as my heart pumped the adrenaline through my body, I wondered how many times those exact words had been someone’s last! Of course, we made it to the ground safely, and being safely on “terra firma” I mentioned to the pilot that I had never been so close to that mountainside before. After a little friendly teasing, he apologized and explained that he had simply followed protocol for a suspected faulty altimeter. By finding a benchmark at a known altitude, and then getting as close as safely possible to compare the altimeter reading, he could check for sure whether the altimeter was faulty or not. Taking off at Kosarek...towards Mike's mountain...the benchmark. This made Amy and I reflect on sin. Of course, our ultimate benchmark needs to be what is right according to God’s Word. A benchmark on a mountainside can only be set by using an accurate altimeter. If a pilot were to check a faulty altimeter by using a faulty benchmark, he may think his altimeter was accurate. The results could be disastrous if he were forced into the clouds, assuming his faulty instruments to be accurate. We often end up playing too dangerously close to faulty benchmarks, set by defective morals, all the while trying to stay an "arms-length" away. The problem with these dangerous benchmarks is that we may end up finding ourselves “in a fog,” with danger much closer than we realize (1 Tim. 1:18-19). Though many of our Papuan friends are professing Christians, they still await God’s Word in their language, so that they can understand the one and only accurate benchmark for their faith.